Optimal chick quality and maximal hatchability depend largely on the environmental conditions that we create in the setters and hatchers. When these conditions meet the demands of the embryo, conversion of egg content into embryo and hence the development of the embryo will be optimal. Good quality day old chicks will be the result. Next to adequate turning of the eggs, the number one priority in incubation is the control of the internal temperature of the eggs. As this temperature determines the speed of the development of the embryo and with it the balance in supply and demand of nutrients for the embryo, a precise and uniform control of the temperature is needed. The second priority is an adequate control of the relative humidity (RH). The egg needs to lose a certain amount of moisture during incubation to create the air cell, and RH creates the driving force for the moisture loss of the egg. In older machines that have limited cooling capacity, evaporation of water is needed to supply additional cooling. With this evaporation the RH in the machine will change, so also for temperature control the RH is important. Last but not least, the embryo needs oxygen (O2) and produces carbon dioxide (CO2), so the machines need to exchange the air to provide this. In all these three components of the incubation process (temperature control, RH modifications and O2/CO2 balance) the ventilation of the machines plays an important role. But although we know quite well the demands and the controls for temperature, RH and gas exchange, the correct ventilation of machines during different stages of incubation is much less clear and often a subject for debate. With this article we want to make an attempt to put together some numbers and equations, which can be helpful to clarify the different aspects that need to be taken into consideration when we think about ventilation. For practical purposes we will focus on the setters, but the same type of equations can be made for hatchers as well. In our calculations we will use a standard, imaginary machine of 100.000 eggs of 65 gram average, with 100% fertility. This machine is used in either single stage or multi stage mode, depending on the topic we address. Let’s start with the calculation of the amount of ventilation that is needed for O2 and CO2 exchange. To do this we will focus on the production and the control of CO2, as this is the factor that will dictate the demand for ventilation, much more than the control of O2. If we control the CO2 at the right level, the O2 will not likely be the limiting factor. During the growth of the embryo, the egg nutrients need to be converted into body tissue, which requires O2 and produces CO2 in a more or less fixed ratio (Respiration Quotient or RQ-value). This O2 uptake and CO2 production is linearly related to the heat production of the embryo. This means that if we know the heat production of the embryo (or in our case 100.000 embryos), we can calculate the production of CO2 per unit of time using the formula of Brouwer (1965): Energy production (kJ/hr) = 5,0 x CO2 production (liters/hr) + 16,2 x O2 consumption (liters/hr). With a RQ = 0,67, which is normal for incubation, the rate of oxygen consumption is CO2/0,67. From research we know that an embryo of 18 days produces approximately 0,15 Watt of energy, or 15 kW of energy in a machine of 100.000 eggs. For each kW of heat that is produced by the embryos, 117 liters of CO2 are produced per hour. At d18 accordingly, 100.000 embryos produce approximately 1.750 liters of CO2 per hour. If we know the production of CO2 and we know the level of CO2 we want in our machines, we can calculate the required ventilation rate to achieve this level. If we want to have a maximum CO2 level of 4.000 ppm and we bring in air that contains 500 ppm of CO2, the embryos can add 4.000 – 500 = 3.500 ppm. Ppm means part per million, so the embryos can add 3.500 parts per 1.000.000 parts, or 3,5 parts per 1.000 parts. A cubic meter of air is 1.000 liter, so 3,5 parts to 1.000 parts relates to 3,5 liter CO2 per m3 of air. The machine is producing 1.750 liters of CO2, so if the embryos add 3,5 liter to each m3 of air that passes through the machine, we have to ventilate 1.750 / 3,5 = 500 m3 of air in a machine with 100.000 fertile eggs at 18 days of age. If we want to maintain a lower CO2 level in the machine or the incoming air has a higher level of CO2 we obviously need to ventilate more. If we want to lower the CO2 level to 3.000 ppm and the incoming air contains 1.000 ppm (because the incoming air is for example not fully refreshed) the embryos can add 3.000 – 1.000 = 2.000 ppm or 2 liters of CO2 per m3 of air. As the eggs are still producing 1.750 liters of CO2 per hour, we need to ventilate 1.750 / 2 = 875 m3 per hour. Half way through the setter period at day 9, the embryo is much smaller and the heat production and CO2 production is much smaller as well. At day 9, the embryo produces approximately 0,022 W, so 2,2 kW per machine instead of 15 kW at 18 days. At this stage, embryos produce about 260 liters of CO2 per hour. If we again want a CO2 level in the machine of 4.000 ppm and the incoming air is again 500 ppm, the embryos can still add 3,5 liter of CO2 to each m3 of air, but as they now only produce 260 liters of CO2 per hour, ventilation rate needs to be adjusted to approximately 260 / 3,5 = approximately 75 m3 of air per hour. In a multi stage incubator we need to ventilate for an average sized embryo, as there are continuously fresh eggs set and full grown embryos removed from the machine. If the heat production in the machine would be the average of each of the 18 days of incubation, the average heat production in the machine would be approximately 5,4 kW and the CO2 production would be 630 liters per machine per hour. To get 4.000 ppm, it would mean that we have to ventilate 630 / 3,5 = 180 m3 per hour. As we do not set eggs every day but in periods of 3-4 days, the average peak heat production in the machines is slightly higher, but in theory a ventilation level of 180 m3 is sufficient to create 4.000 ppm. We often see much more ventilation in multi stage machines, because they often have limited cooling capacity, which is the reason that CO2 levels are often much lower as well. A single stage hatchery is also a multi stage operation by itself as eggs of many different stages of incubation are present. This means that for calculation of the ventilation requirements in a hatchery we can use the average heat and CO2 production over all machines. Eggs produce moisture which needs to be removed. 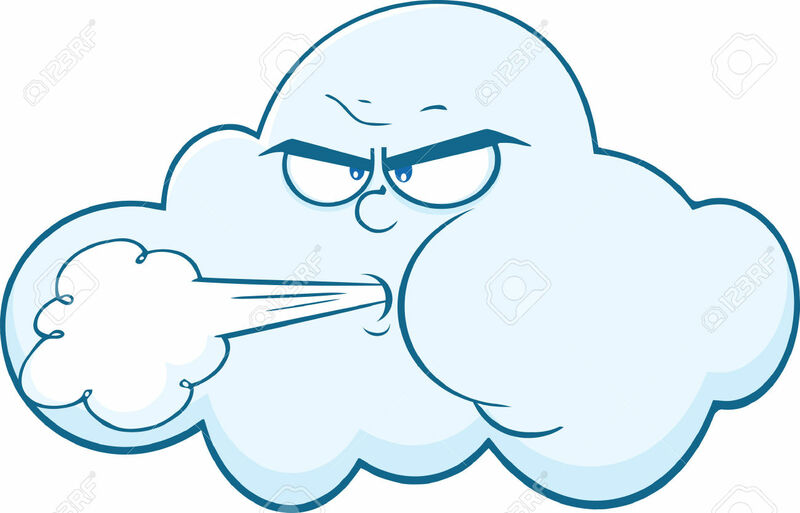 If we know the amount of moisture production and we know the amount of moisture in the incoming and outgoing air, we can calculate how much air is required to remove moisture. At lower ventilation rates the relative humidity (RH) in the machine will go up, at higher ventilation rates the humidifier will come in to compensate for low RH. If a machine contains 100.000 eggs of 65 g, the total egg mass is 6.500 kg. Eggs should lose approximately 12% weight in 18 days, which is totally due to the loss of moisture. These eggs lose 780 kg of moisture in 18 days, or 780 / 18 / 24 = 1,8 liter or 1.800 g per hour. The loss of heat by evaporation is 2.260 kJ per liter of water and so 1,8 liter of water will require 4,1 MJ. The specific heat of eggs is 3.4 kJ per ºC per kg, so it will require 22.1 MJ to cool down 6.500 kg of eggs by 1ºC. The heat loss by evaporation through egg weight loss will therefore decrease the average egg temperature by 4,1 / 22,1 = 0,18ºC. As a comparison, if the same amount of water is sprayed to only 10% of the eggs it will cool down eggs locally by 1,8ºC extra and the remaining 90% of the eggs not at all. The quantity of moisture in the air can be found in the Mollier diagram, or by using one of the many apps and programs available on the internet. If the air that enters the machines is for example 24ºC and 60% RH, it will contain 13 g of moisture per m3 at sea level. If the temperature in the machine is 37,5ºC and RH is 55%, it will contain 24,8 g of moisture per m3. That means that every m3 of air that passes the machine will get 24,8 – 13,1 = 11,7 g of moisture. If 1.800 g of water needs to be removed per hour, we need to ventilate 1.800 / 11,7 = 154 m3 of air. The Excel sheet to make these calculations for dewpoint temperature and ventilation requirements using temperature, humidity and air pressure can be downloaded here. During the second half of incubation the ventilation rates for CO2 removal is higher than ventilation rates to maintain relative humidity on the required level. As a consequence, more humid air is exchanged and the machine will start humidifying. If the ventilation based on CO2 is 500 m3 per hour, how much will the machine spray? The incoming air contains 13,1 g and the outgoing air 24,8 g of moisture per m3, resulting in a loss of 11,7 g of moisture per m3. With a ventilation rate of 500 m3/hr the air will remove 500 x 11,7 = 5.580 g of moisture per hour. The eggs are adding 1.800 g per hour, so the machine has to spray 5.580 – 1.800 = 4.050 g of water per hour to maintain RH at 55%. This is by itself not a problem, but evaporation of water costs energy. As this energy is mainly supplied by the eggs close to the sprayer, it will create an uneven temperature distribution in the machine. 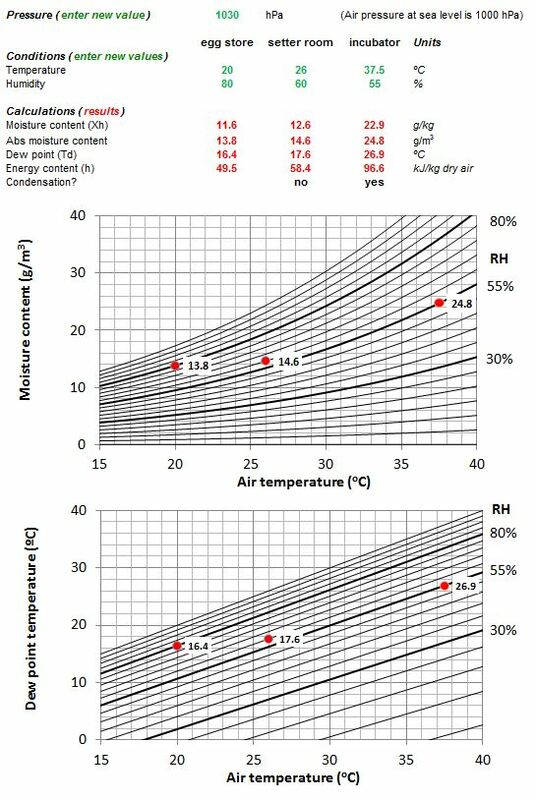 If we want to avoid spraying, we have to accept that the RH drops if the ventilation increases above that level of 150-160 m3 per hour (at the humidity and temperature levels we determined). Without extra spraying, the RH will drop. At a ventilation rate of 500 m3/hr and eggs producing 1.800 g of water per hour, every m3 will pick up 1.800 / 500 = 3,6 g of moisture. If the incoming air contains 13,1 g of moisture, the air in the machine will have 13,1 + 3,6 = 16,7 g of moisture. Air of 37,5ºC with 16,7 g of water will have a RH of 38%. This is not totally correct, as due to the lower RH the moisture loss of the eggs will increase, and instead of 1.800 g per hour they will lose more moisture and consequently the RH will not drop that deep but will remain between 40 and 45%. But it shows that when we ventilate for CO2 and we do not want the sprayer to be (over) active, we have to accept quite a low RH at the end of incubation. Especially in the second part of incubation we need to remove the embryonic heat from the eggs to prevent eggs from overheating, which requires sufficient cooling capacity. Cooling can be organized in 3 different ways, by having cooling coils in the machine, by evaporating water and by removing heat through the exchange of air (ventilation). If ventilation would be the only cooling source, we can calculate the required ventilation based on the energy content of the incoming- and outgoing air. Like the water content (g/m3), the energy content of air can also be found in the Mollier diagram. The energy content of setter room air of 24ºC and 60% RH is approximately 45 kJ/m3. The energy content of air in the machine running at 37,5ºC and 55% RH is approximately 85 kJ/m3, so each m3 of air that passes the machine will pick up 40 kJ of energy. If ventilation is the only cooling source, at 18 days of incubation we need to remove 15 kW of heat by air exchange. A watt is equal to a Joule per second, so 15 kW of heat production equals 15.000 x 3.600 = 54.000 kJ per hour. Each m3 of air picks up 40 kJ, so if we want to remove the produced heat by ventilation only, we need to ventilate 54.000 / 40 = 1.350 m3 of air for a machine with 100.000 eggs. In a multi stage machine approximately 5,4 kW needs to be removed, as explained in the part about ventilation for CO2. 5,4 kW is 5.400 x 3.600 = 19.440 kJ per hour. With 40 kJ added to each m3 of ventilation, this would require 19.440 / 40 = 486 m3 of air per hour. This calculation is quite sensitive for the conditions of the incoming air. If the incoming air is not 24ºC and 60% but 27ºC and 60%, the energy content would be 53 kJ/m3, and the air would pick up 85 – 53 = 32 kJ/m3 instead of 40 kJ/m3. For a single stage machine at 18 days ventilation rate should be increased to 54.000 / 32 = 1.688 m3 of air per hour, which is about 25% more. But most modern machines have cooling coils for the removal of heat. If we ventilate for carbon dioxide, we need 500 m3 per hour. This ventilation will take away 500 x 40 kJ = 20.000 kJ. We needed to remove 54.000 kJ, so the cooling coils should have the capacity to take out 54.000 – 20.000 = 34.000 kJ per hour. If we do not want to ventilate more than required for CO2 but we do not have cooling coils, we need to take out heat by evaporation of water, again 34.000 kJ per hour. Evaporation requires 2,25 kJ per g of water, so we need to evaporate 34.000 / 2,25 = 15,1 liter of water per hour. When we evaporate this amount of water with an ventilation volume of 500 m3 per hour, each m3 of air will get 15.100 g / 500 = 30,2 g. When the incoming air is 24ºC and 60% RH it contains 13 g of water per m3. With the water from the eggs (1.800 g per hour so 1.800 g / 500 m3 = 3,6 g / m3) and the water of the sprayer (30,2 g/m3) the total amount of water in the air would be 13 + 3,6 + 30,2 = 46,8 g/m3. This is more than 100% RH, so it is obvious that when we need to rely on cooling by evaporation, we need to ventilate much more to get acceptable levels of RH, or we have to accept that we need cooling coils to keep egg temperatures under control. 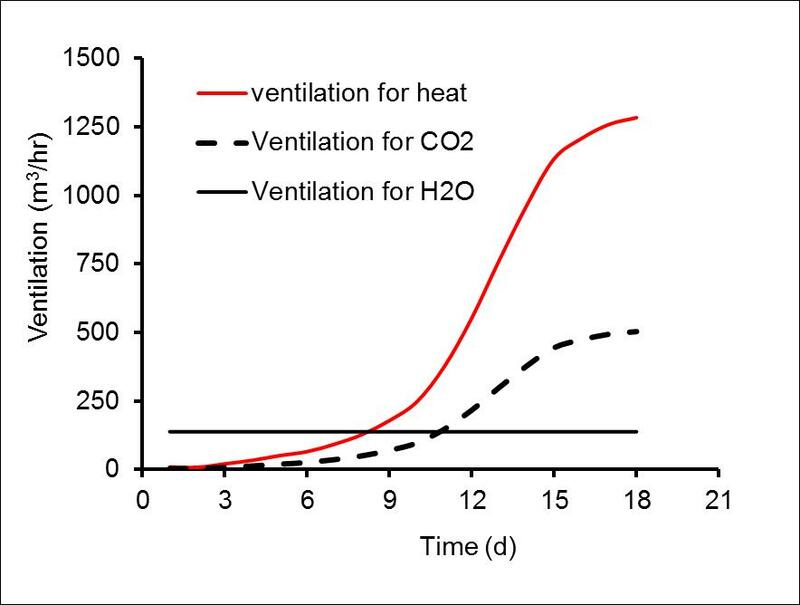 Graph: theoretical ventilation levels during incubation for a 100.000 egg machine, based on heat exchange, carbon dioxide control and relative humidity control. The Excel sheet to calculate ventilation requirements and effects of additional spraying on egg temperatures van be found here.